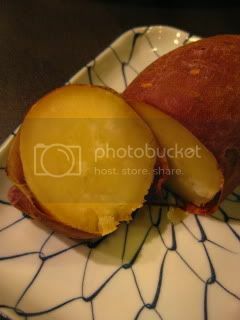 I simply roasted a satsuma yam (Japanese sweet potato) in my tagine-style donabe, "Fukkura-san", over medium-high heat on gas stove top. 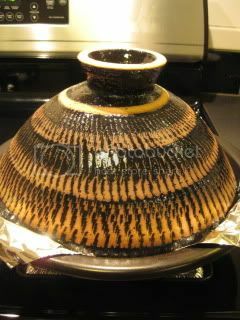 Because this donabe is safe for dry-heat cooking, and also because it promotes natural FIR (Far-Infrared Radiation), it makes wonderful "Yaki-imo" (roasted yam). 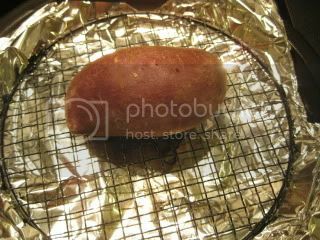 I just put a yam on a grate and covered with wet lid (which gives steam-effect during roasting), and let it cook for nearly 60 minutes to achieve extra density in the interior of the yam. The result...just as I expected! It was so dense and sweet inside. 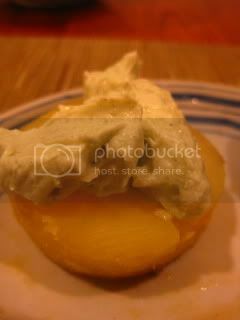 I served it with my koji spread (2:1:1 cream cheese/ shio-koji/ amazake base + a little green tea powder). It was a match made in donabe heaven.